Hi Fawn Friends! 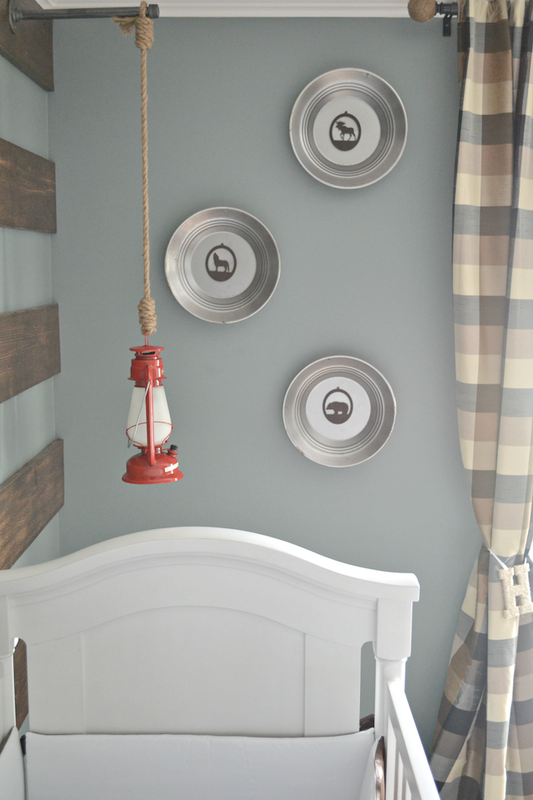 I can't believe the day is finally here I get to share our long awaited Nursery reveal for the arrival of our baby boy! 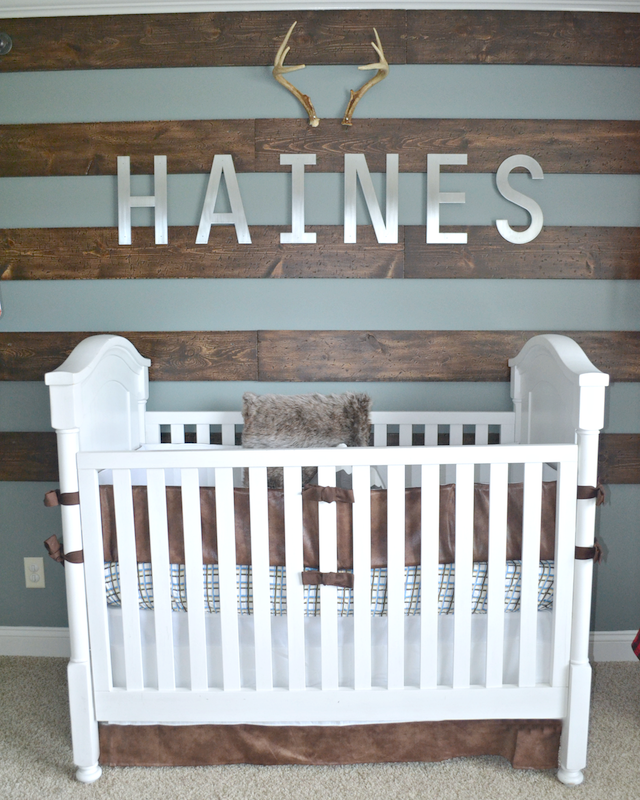 This room has been a labor of love for the past 6+ months and I'm happy to say it is now complete and ready for baby Haines to call it his own. 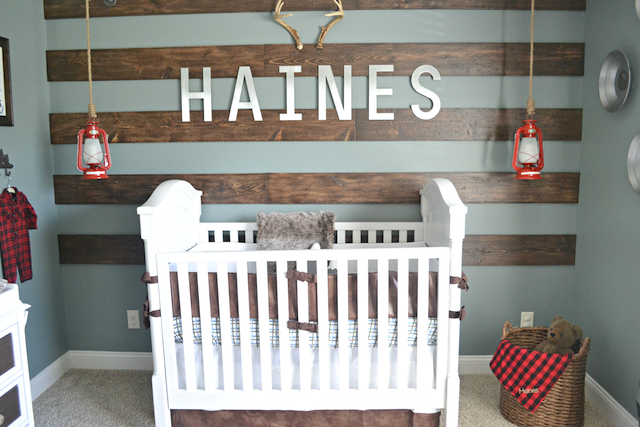 We went with a masculine rustic theme with this nursery. After living in Alaska for 4 years, we fell in love with the people and the beautiful state. I think it would be safe to say that my husband is and always will be "obsessed" with Alaska. 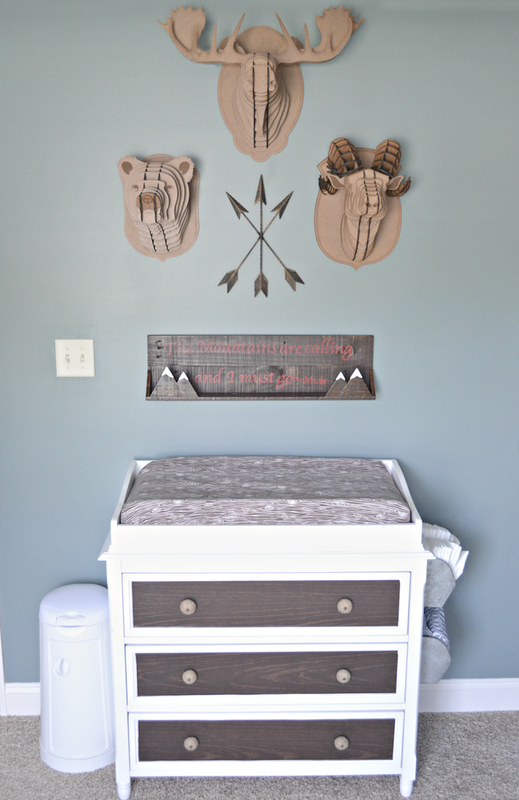 The day we moved was a sad sad day for him, so I thought a rustic Alaska-Inspired nursery for his baby boy would go over well to say the least. 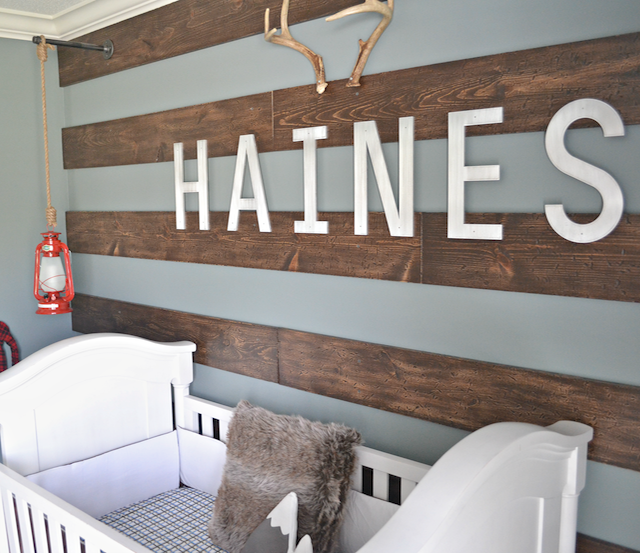 With Kenzie's nursery I obviously went the girly route, so when it came time to start piecing Haines's nursery together my husband showed a little more excitement this time around regarding the decor and ideas I had planned. Which is a good thing because I needed his muscle and power tool expertise on a few DIY projects. I'm so happy with how this space turned out and I can't wait for our baby boy to get settled in. 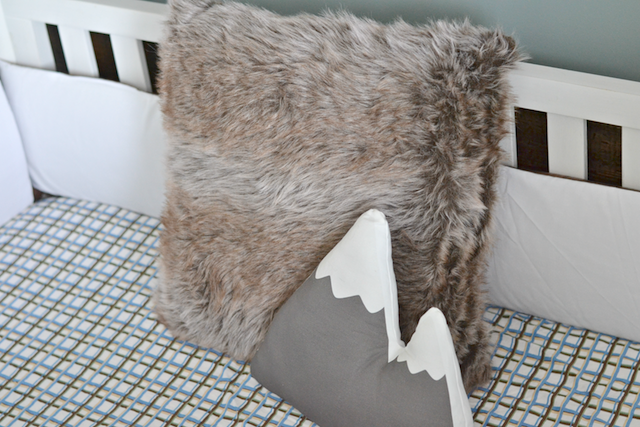 I found this adorable mountain pillow on Etsy from Dear Violet Shop and thought it would be so fitting for our theme and when it came in, I was blown away at how beautifully made it was. My hat goes off to perfectionist sewers, you can really tell who puts time and effort into their items and Patti definitely does. 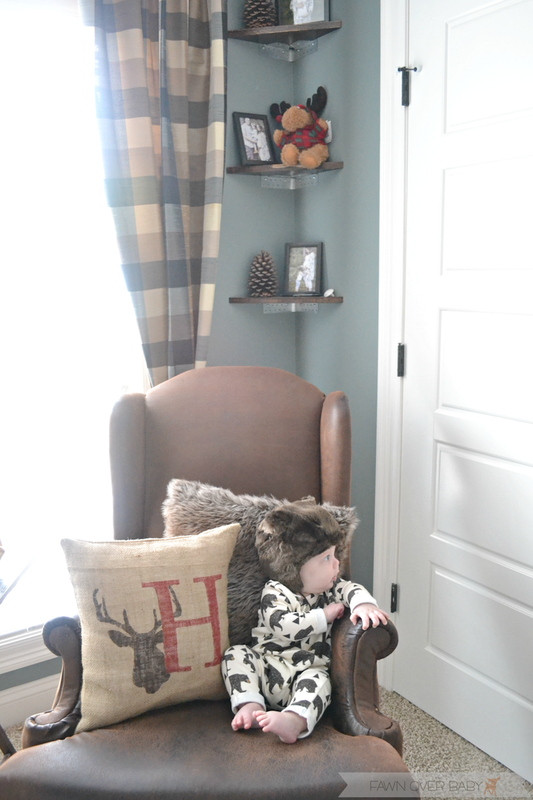 I also purchased a set of two of these faux fur pillows from amazon to add a little softness to the space. Then came time to start accenting the wall. 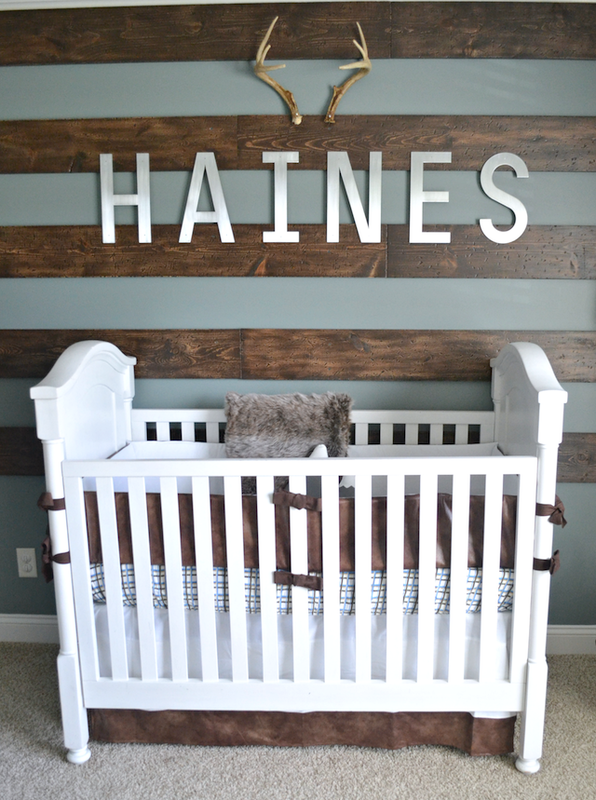 I knew I wanted Haines's name in big metal letters and as luck would have it, my handy husband was able to use a water jet to create each letter in the exact dimensions that I needed. 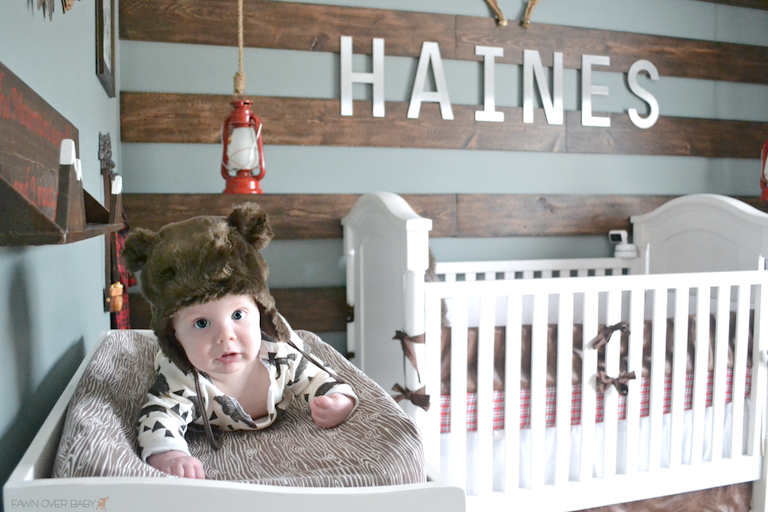 While visiting my garage-held captive husband during one of his many late night diys, I found a pair of antlers he just had laying around and thought they would be the perfect header above our baby's name. 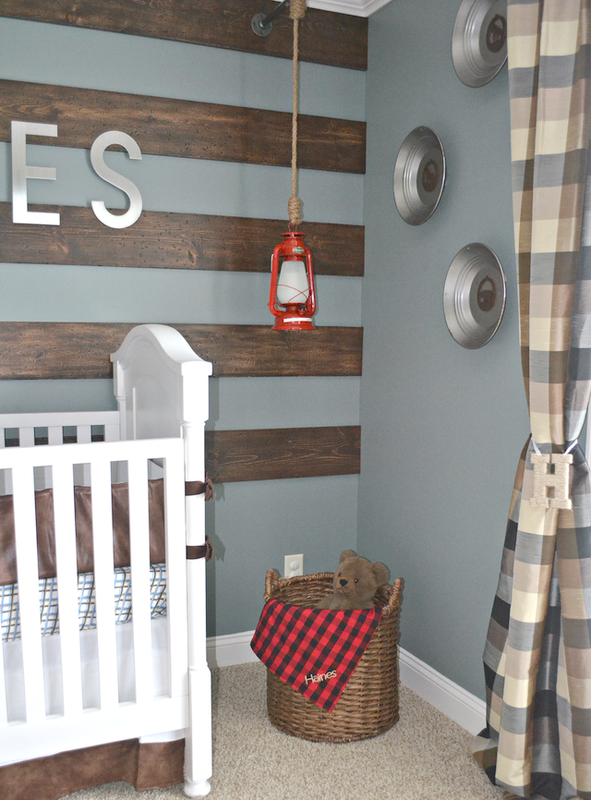 Later came the idea to flank each side of the crib with hanging lanterns, to bring an even more lodge feel to the room. 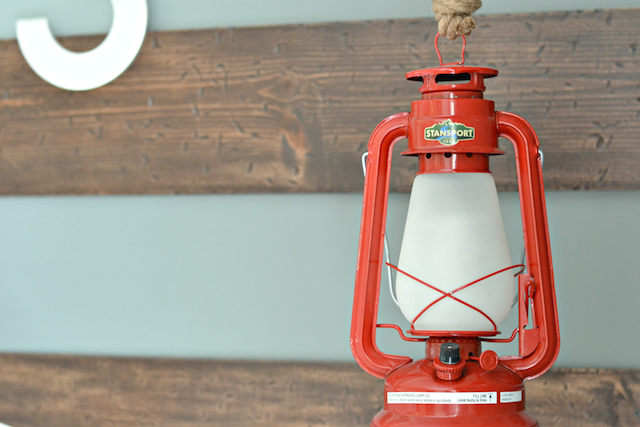 These are actually oil lanterns that my husband turned into LED battery operated lights. Which is nice as they give the perfect amount of glow to the room at night. 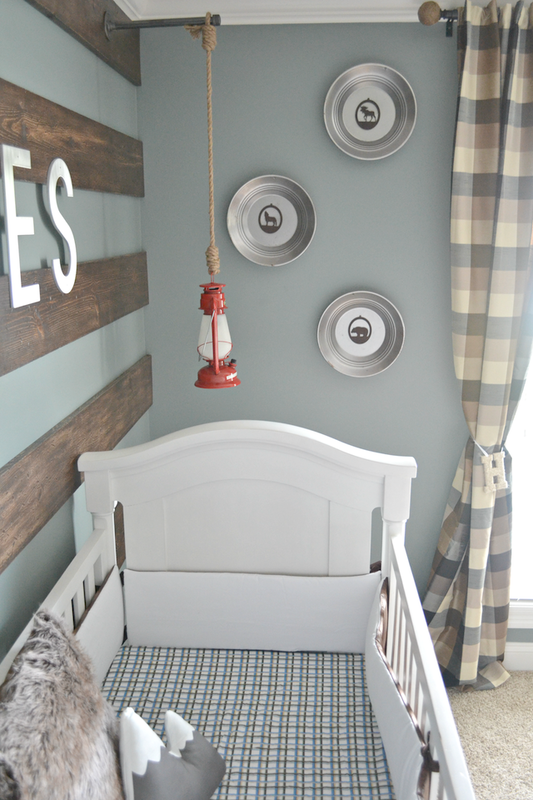 For the bedding I kept it real simple with a plaid sheet my sweet mom purchased for us at Target and this awesome custom leather bumper and crib skirt from the amazing Mellissa's Boutique over on Etsy! She was so great to work with and found the exact color of leather to match our wood accents around the room, making for the perfect way to tie it all in together. 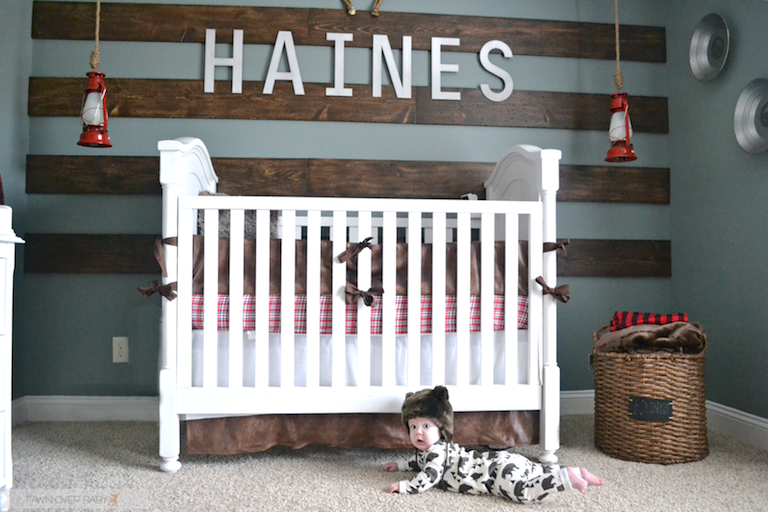 If you are needing custom bedding and/or linens for your nursery, I would definitely recommend this shop! 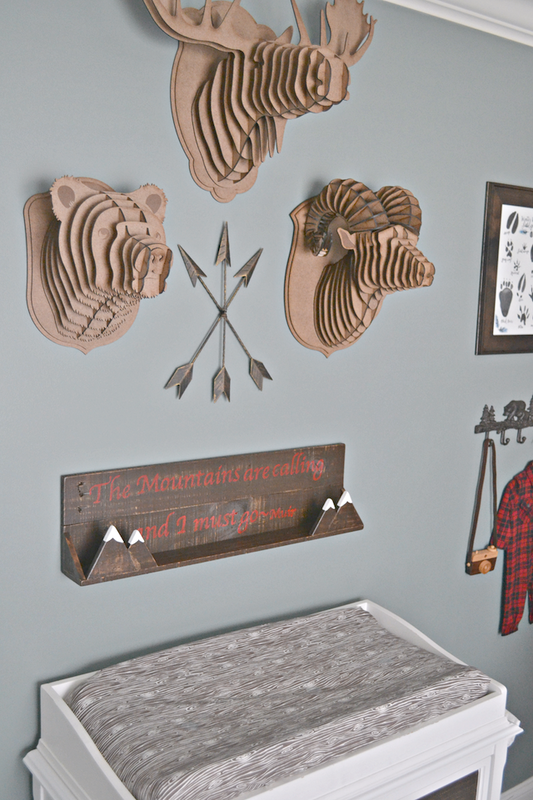 While looking through a few "alaska - inspired" pins on Pinterest, I found that someone pinned a few gold-mining pans as wall decor. I immediately thought " genius", how could I not incorporate one of the many wonderful things Alaska is known for in our room. 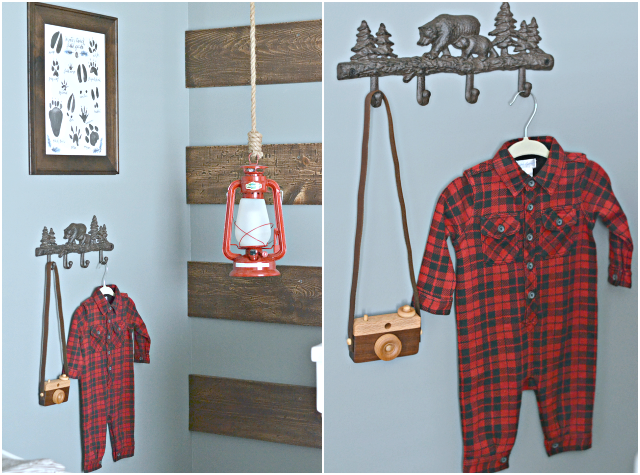 So I purchased these mining pans from Home Depot and added these adorable wild animal wood ornaments from etsy shop Texas ArtCraft and stained them the same walnut stain that we used on the wood wall. I purchased these curtains that matched our wall color and the room theme perfectly at Hobby Lobby. 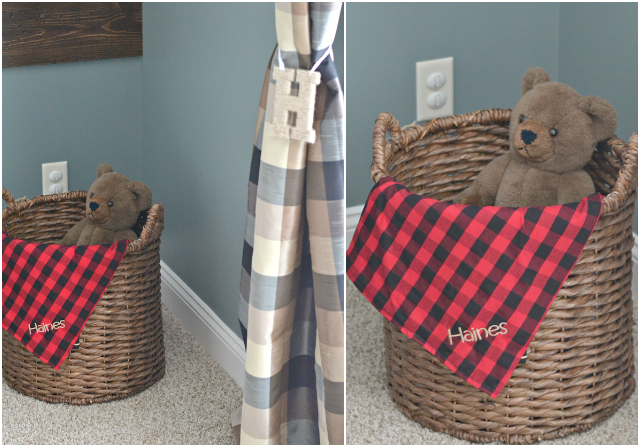 The basket is Smith and Hawken from Target and the adorable personalized buffalo plaid receiving blanket is from wonderful Etsy shop: Ooh Sew Charming. The sweet twined wrapped letter that I'm using as a tie back was found at Michaels on their clearance aisle! 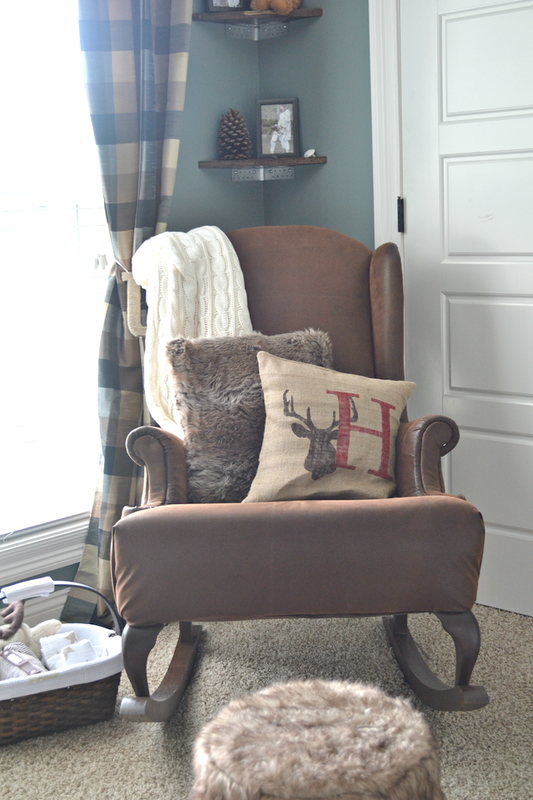 Moving over on the right side of the room is this comfy wingback rocker that my husband and I worked on for severrrrrrrrral months, reupholstering and adding runners so that we will have a nice place to sit while feeding and/or rocking Haines. 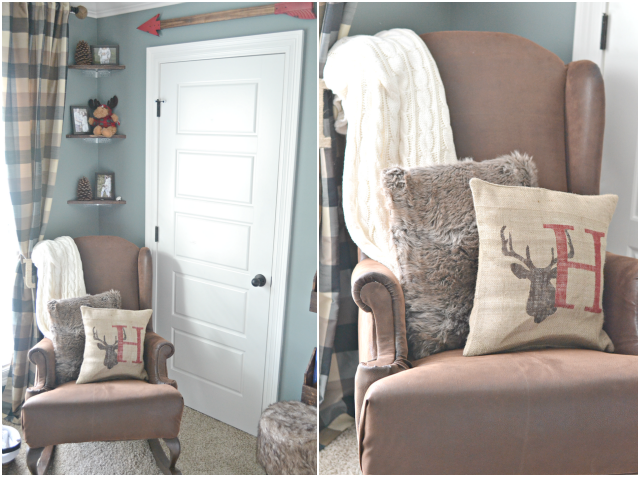 Click HERE to see the steps we took to make-over this dandy of a chair! 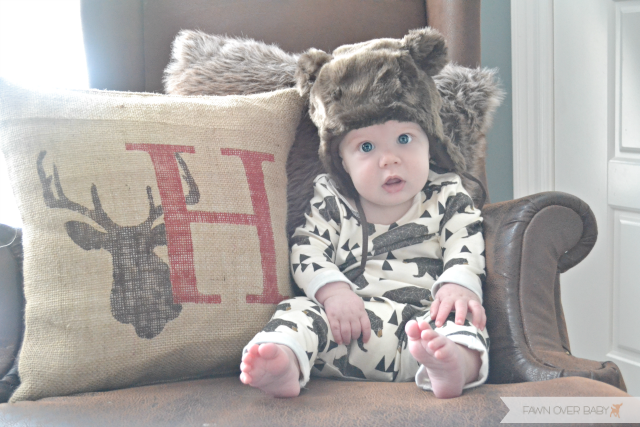 The sweet personalized deer head burlap pillow cover is from wonderful Etsy shop: Shamshack. 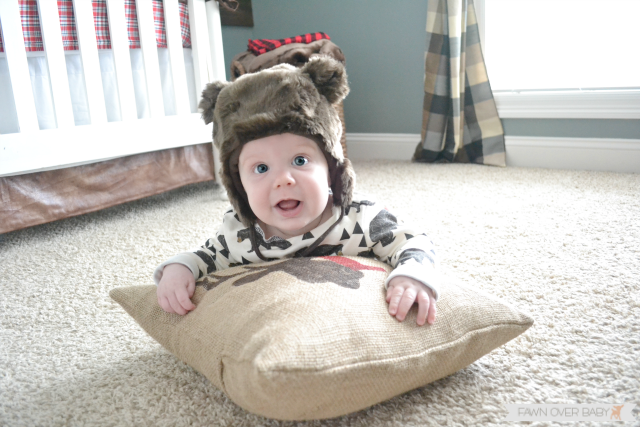 These are just a few fun items I used to create a fun "welcome home" basket for our baby boy. 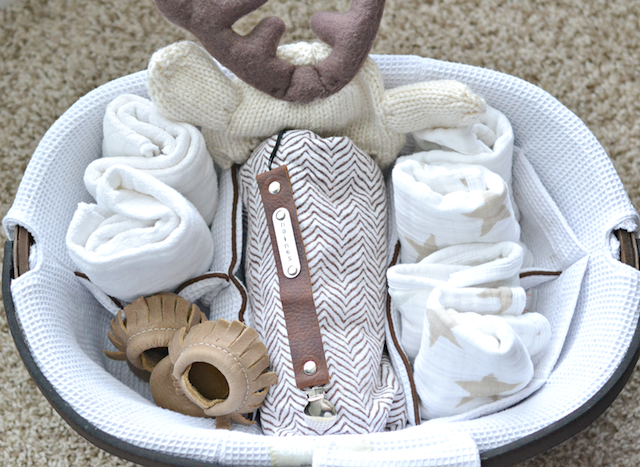 It's filled with Aden and Anais bibs, Pottery Barn receiving blanket (discontinued), Freshly Picked Moccs of course, and the most adorable personalized leather stamped pacifier clip from Cranberries and Capers on Etsy! 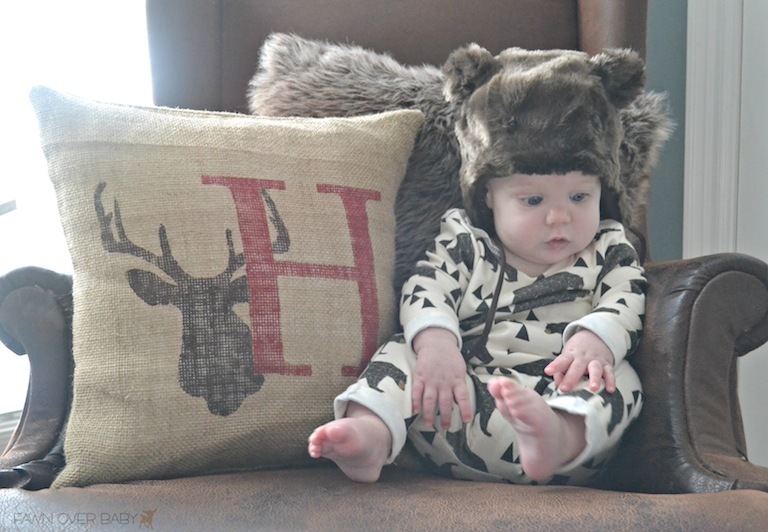 Oh and an adorable antler beanie I received just yesterday from the wonderful fellow mommy blogger/interior designer Rachel from Rachel Elizabeth Creates. My husband created these corner shelves using left over wood from our wood wall. 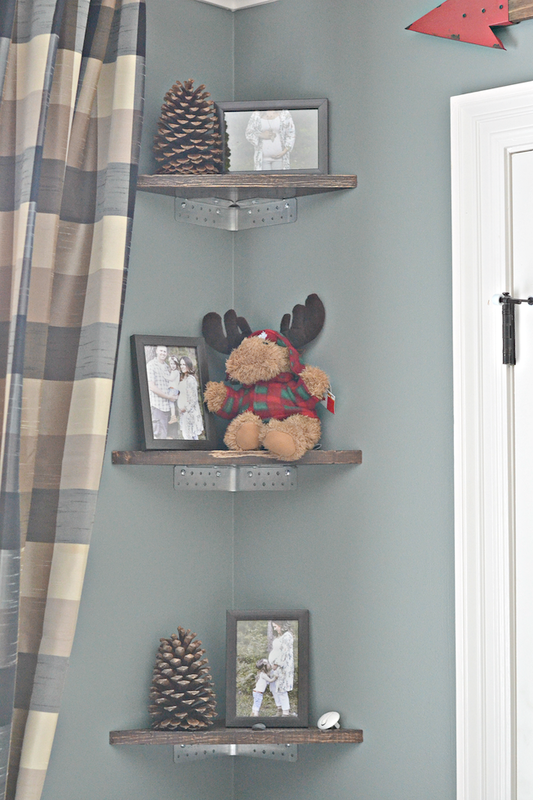 They matched up perfectly and allowed for a space to display a few photos and decorative touches. 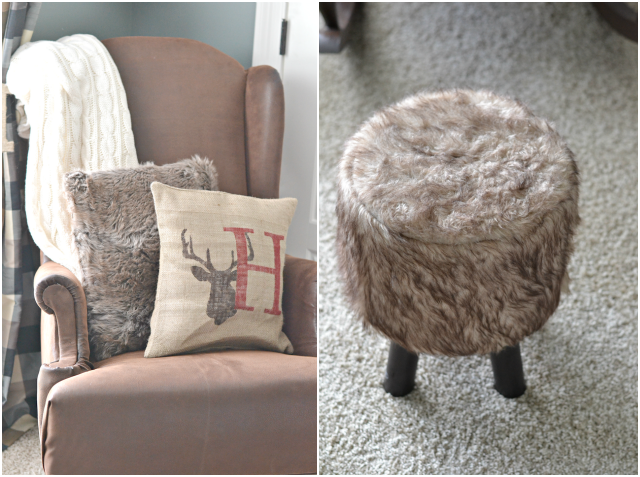 This adorable faux fur foot stool was a steal of a purchase from TJ Maxx. It is the perfect height for a baby to pull up on and/or toddler to sit on …or mommy and daddy to rest their feet on while rocking baby to sleep. 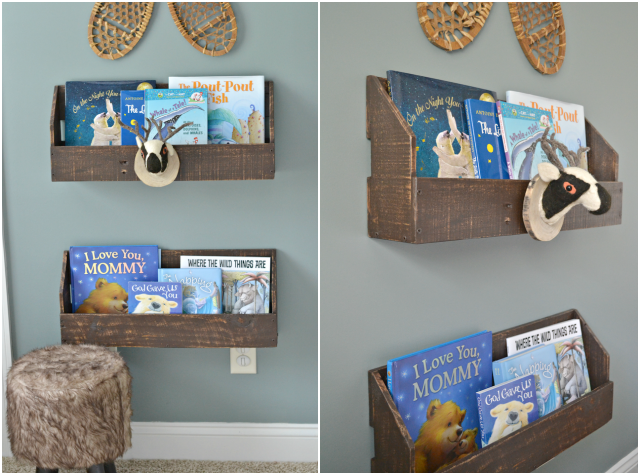 I knew I wanted to set up a reading nook for Haines and came across the infamous pallet wood shelves on Pinterest and thought they would be the perfect way to display a few books from Haines's collection. Of course, I enlisted my hubby to take on this task of cutting these down to size and staining them the same walnut stain as our wood wall. 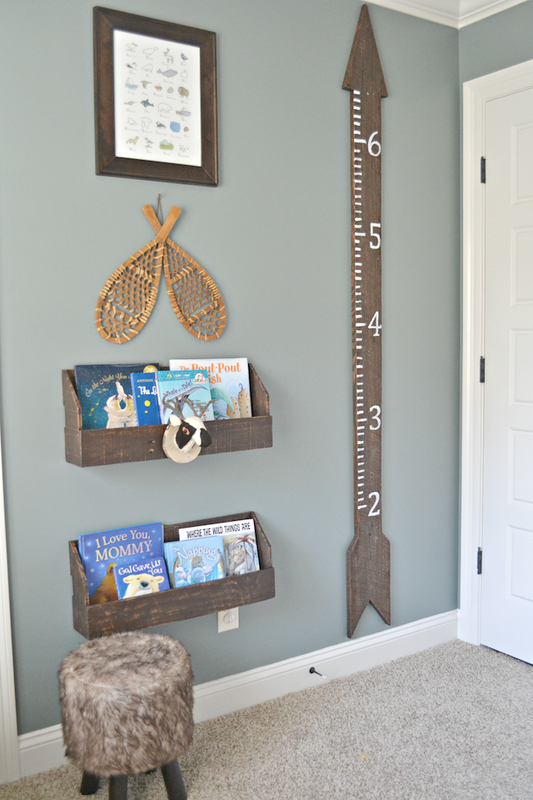 The arrow Growth Chart was a gift from talented interior designer and friend Rylin Crane from a wonderful local store here in town Art & Soul. We ended up staining it the walnut stain to match the rest of the wood pieces throughout the space. 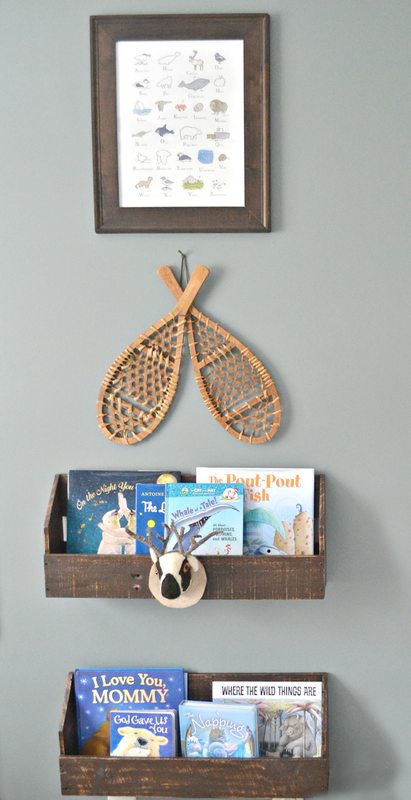 Of course, I had to incorporate snowshoes somewhere in our "Alaskan Themed" nursery, so I found these little cuties from online store: Christmas Prescott. 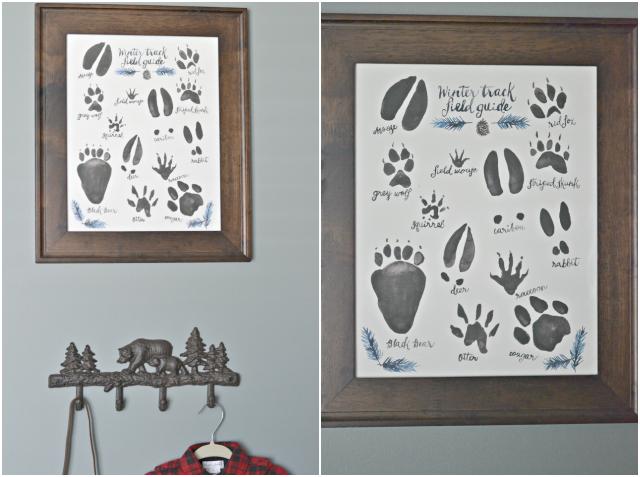 They were the perfect fit for our size room and make for an adorable "alaskan" accent. 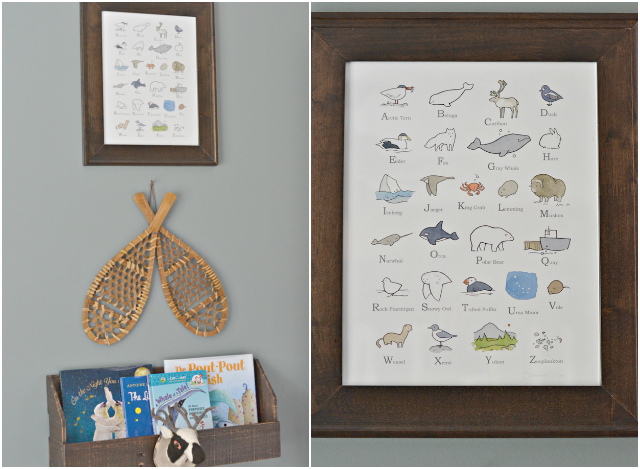 This sweet and fun alphabet print from Etsy Shop: Studio Tuesday was one of the first pieces I purchased for this space as it beautifully displays the alphabet using Arctic Animals illustrated by talented artist and shop owner, David. When we found out we were having a boy, I initially wanted to go out and buy new furniture, or "boy" furniture for this space. My husband quickly reminded me that money in fact does not grow on trees, so I came to the realization that we were going to use Kenzie's furniture instead. 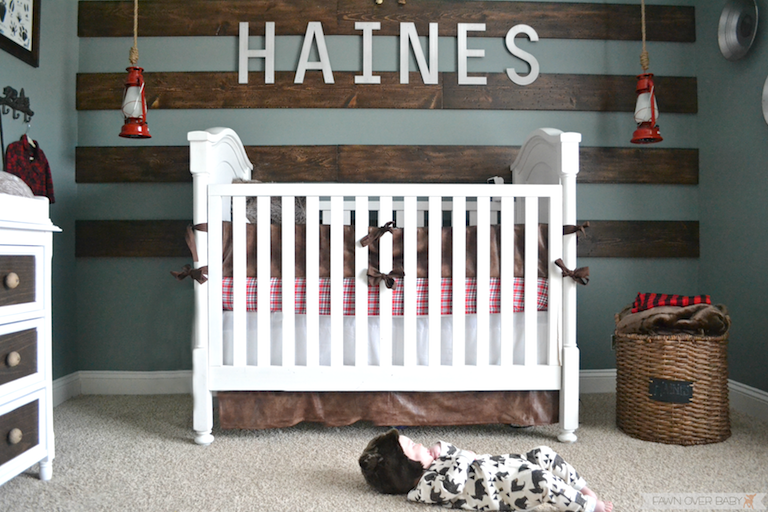 If you have seen her nursery, you know all of those pieces are white! So we went ahead and set up her toddler bed which was actually a smooth transition thank goodness and set up her baby furniture in the nursery. 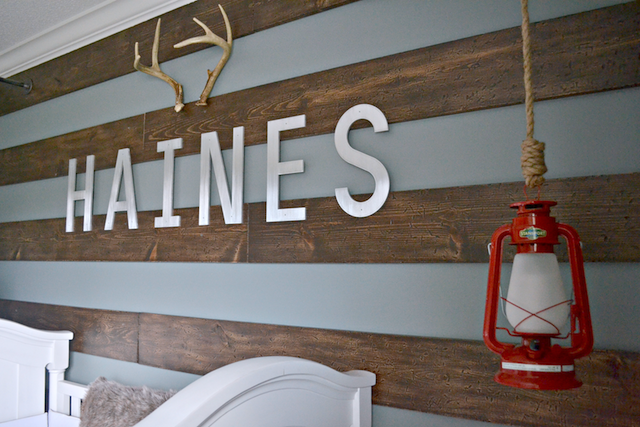 I searched on Pinterest to find ways to add a little masculinity to Haines's all white hand-me-downs and ended up finding this walnut self-adhesive contact paper that I thought would be a wonderful way to add a little rustic touch to this otherwise feminine piece. I chose to cover the front panels of the drawers and added jute covered knobs that I found at Hobby Lobby. I love how it turned out and I have to say after adding it, I began looking around the house for other furniture pieces I could cover but quickly stopped myself from going overboard. I then added a few of these tin storage bins from Michaels on the side to hold diapers and changing station necessities. I found this soft and beautiful wood grain pattern changing pad cover from Etsy Shop: Lake Stree Avenue. 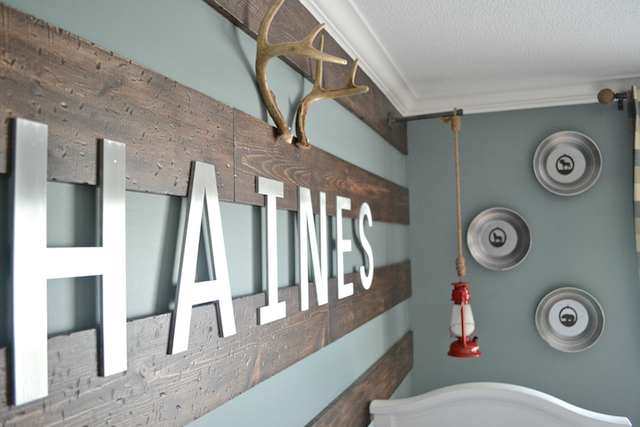 I love how it brings a little bit of the outside in making it a perfect rustic accent for this space. 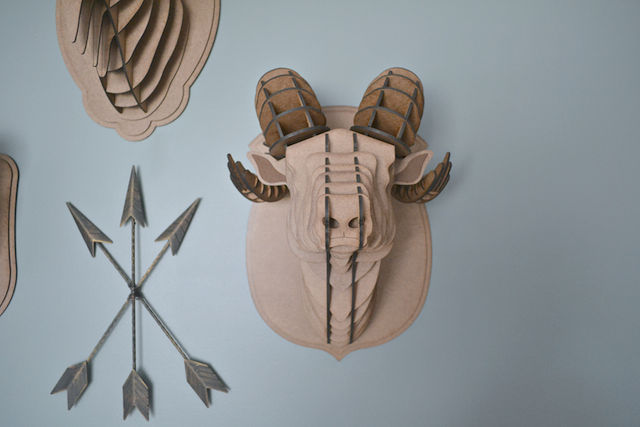 So I can't say enough about these beautiful animal heads from Etsy Shop: Heads On A Wall. 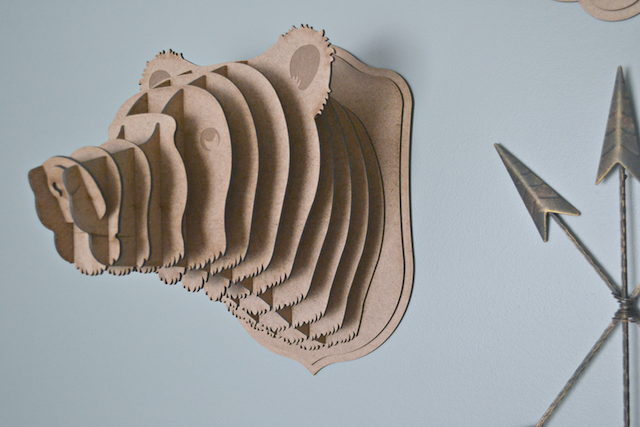 Founded by a 16 year old and his father, this talented duo create these elaborate animals heads using their laser cutter and their own designs that are truly a work of art! I plan on posting more about this wonderful shop soon, so stay tuned to find out more about them and their hardboard masterpiece collection! 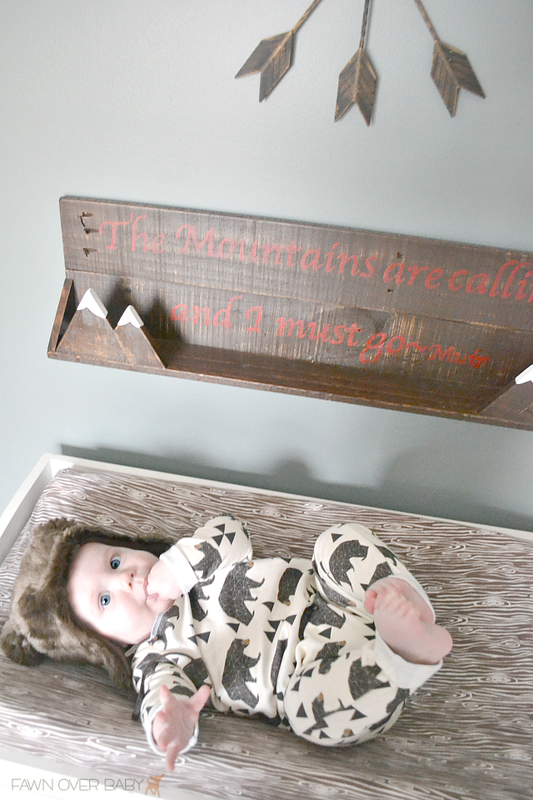 While browsing rustic/mountain decor themes, I kept coming across this quote from John Muir and thought it would be a nice touch to our little space. 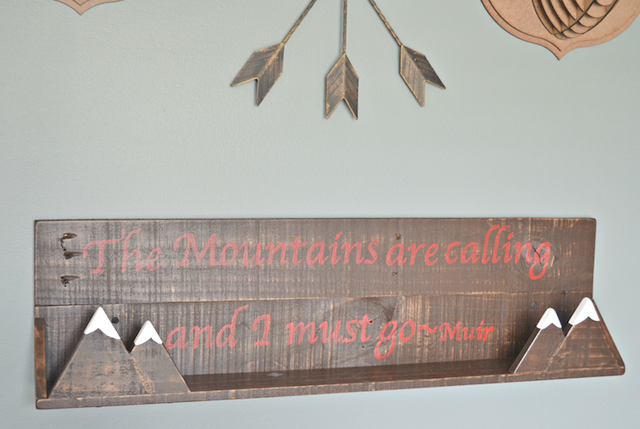 Once again, I enlisted my husband to cut a few pallet wood pieces to size to create a sign and of course we took it a step further and added a ledge with snowcap mountains on each end, because why wouldn't we? (sarcasm). DIY on this coming soon! I sort of made this space our little "hunting/travel" corner of the room. 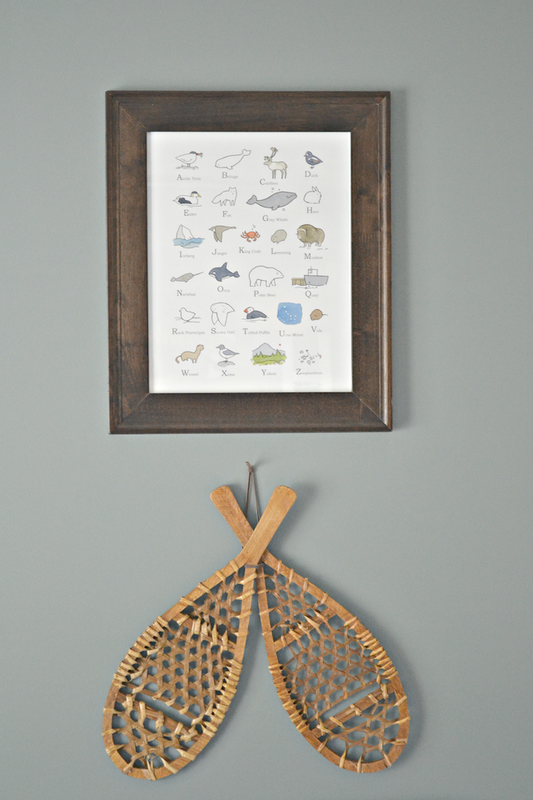 Complete with an Animal Tracks Poster of Northern Arctic Animal Prints illustrated by talented artist Sarah Rose Storm from Shop Wooded Trail. 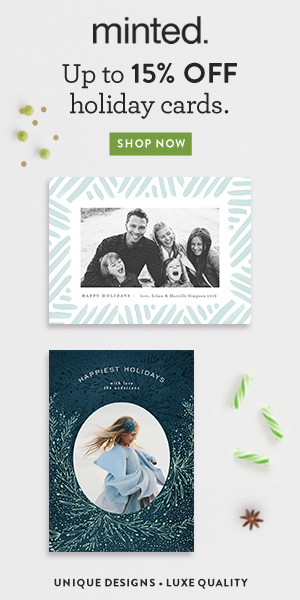 Her amazing one of kind illustrations can be found at online stores such as: Anthropologie, Minted & Papyrus. We also couldn't help but add a little wooden toy we are quite familiar with, inspired by the wooden toy cameras we sell in our own Etsy Shop: Fawn Over Baby, my husband created this one of kind version out of mahogany and oak. I hope you enjoyed my little tour and I can't wait to share photos of our baby boy enjoying his space very soon! 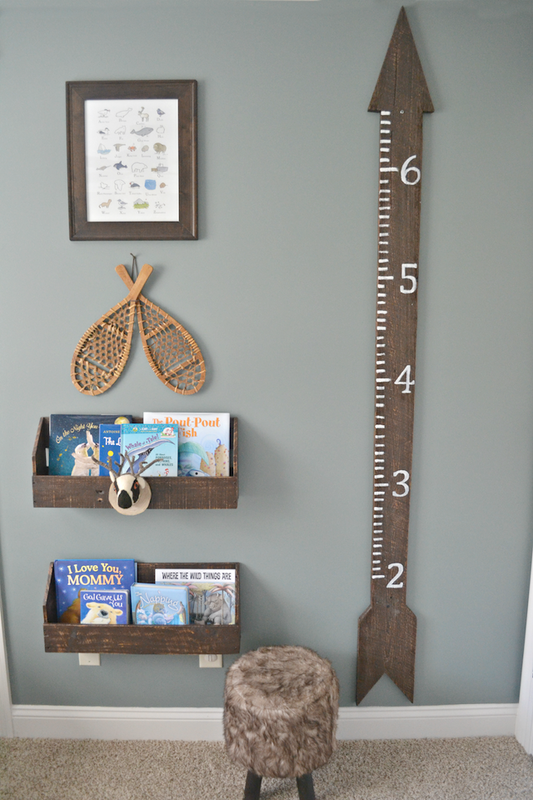 Let me know what you think in comments below and feel free share links to your little lad's nursery, I would love to see! Just wanted to share a little update on our baby boy enjoying his room! 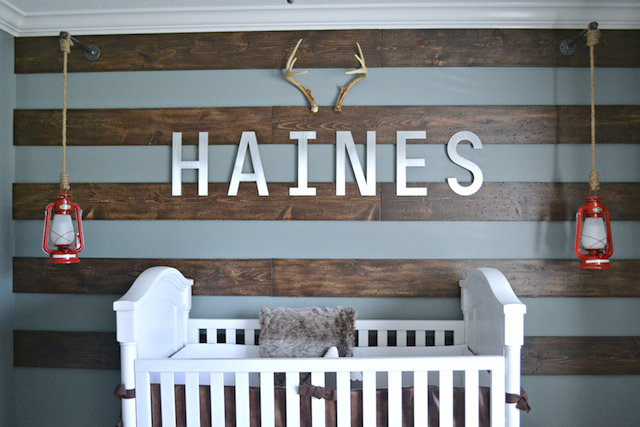 This room has definitely been a wonderful and cozy place for Haines to grow in. He can't get enough of the animal heads from Heads On A Wall! He could stare at them all day. 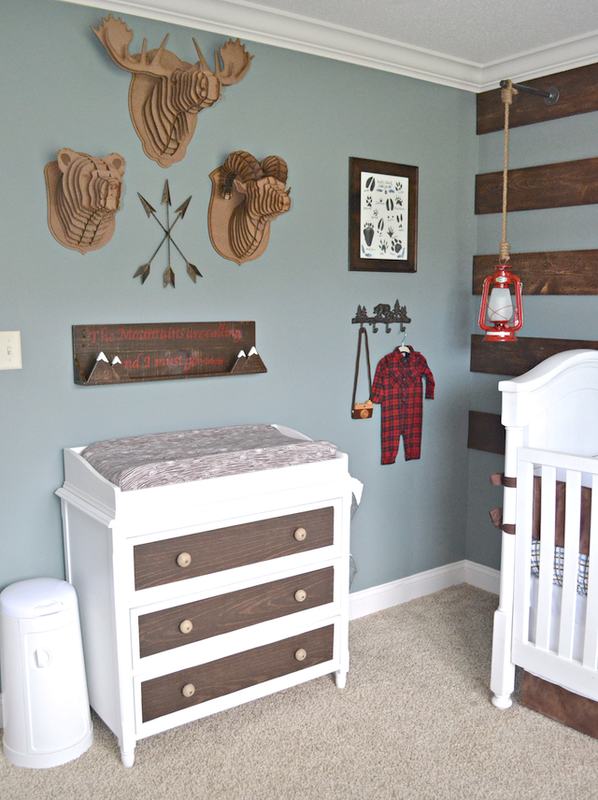 I am so honored that so many you have taken to our little Alaskan space, my mind is already turning regarding a future "big boy room transition", so stay tuned! I love it! Every part of the room is just beautiful! Thank you so much! We love your print!! I just cannot get enough of this space Melissa! What is the name of the paint you used? It's wonderful! I can see this space transitioning seamlessly into a big boy room when the time comes. Great job & congrats again! This is beautiful!!!! So much thought was put into this and it looks like I need to do some shopping on the etsy stores you mentioned. I love those wood head mounts!!!! What color of blue are those walls? Wow. I'm totally drooling over this. 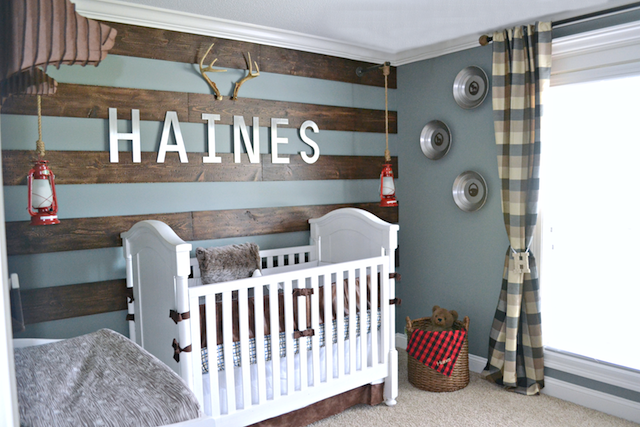 I have 3 boys and would absolutely life to do a room like this but they want to do something different.I just can't talk them into it. I just wanted to stop by and just let you know this is amazing, perfect and on point with every little detail. It's perfect! Absolutely love this room!! Thank you for directing us to Heads on a Wall, we're actually going to order some mounts! Did you get the large mounts? 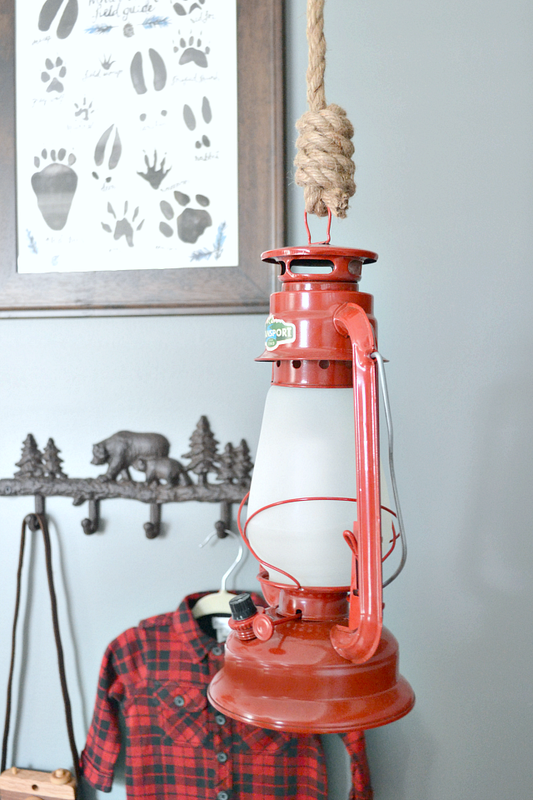 Where did you get these hooks for the lanterns? My husband hung the lanterns with rope (purchased at Hobby Lobby) and hung the rope on galvanized pip and a Falange purchased at Lowes which was mounted on the board attached to the wall. Thanks Dani! 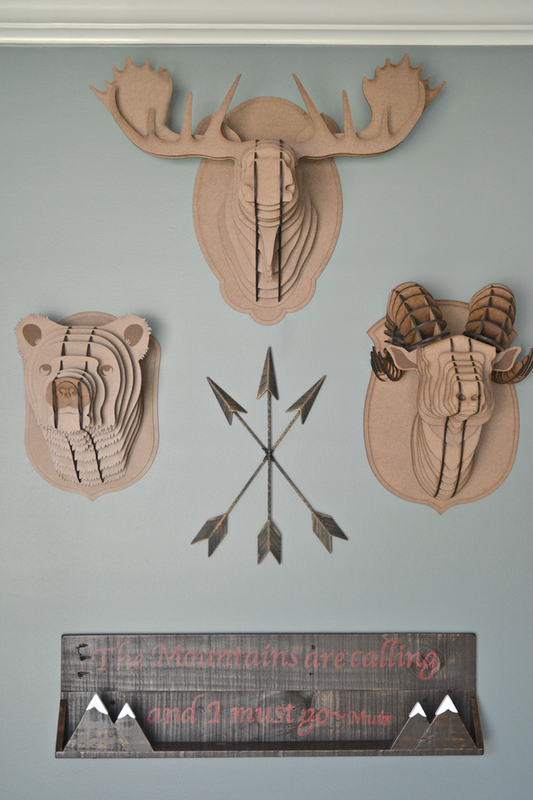 The Animal Heads are from Father and Son Team: Heads On A Wall found on Etsy. I absolutely love this room! 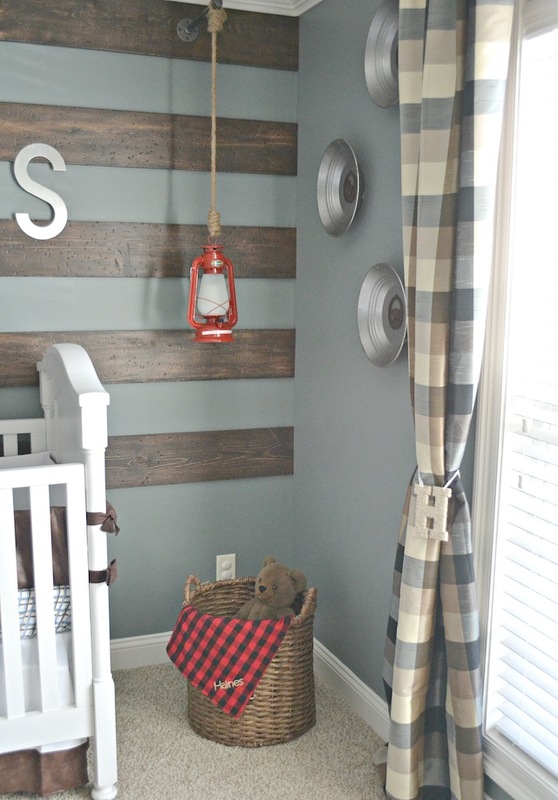 I hope to not offend but I used your feature wall as a template for our nursery and am extremely excited about it! 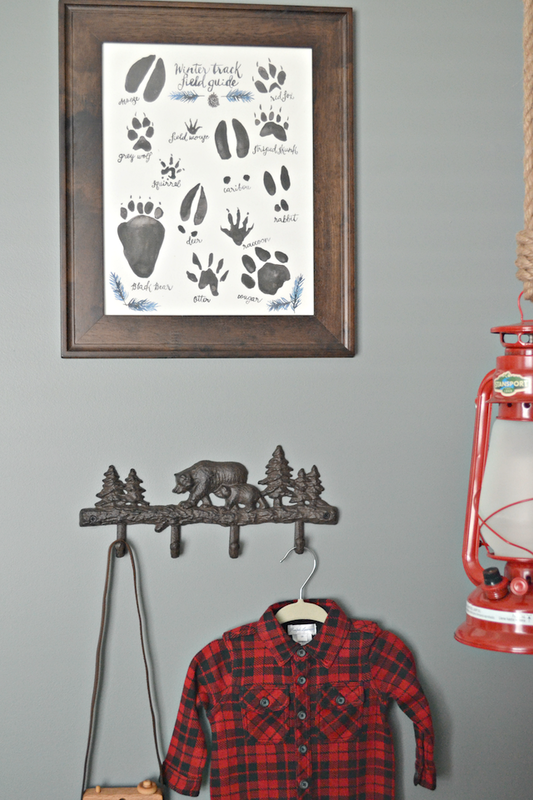 The rest of our nursery is a nod to the past men on my side. With hunting photos, old scout canteens from the 70s, and sheds. Thank you so much for the inspiration! No offense taken at all! I love to read such positive feedback and that we were able to inspire even in the smallest way! Your idea sounds amazing and a beautiful way to include your family history! I would love to see photos of the finished product, it will make my day! This nursery is one of the best i have seen. I loved the whole concept and setup. Specially that lamp and cushion gives the best touch to the theme. Can you tell me from where did you got it? So i can also try to make something like this. Thank you so much Kayla! Your kind words mean so much! I used several cushions to soften up the space a bit. Let me know which one you are speaking of and I'll look into where it was purchased. I included links to each pillow in the verbiage also, if you have time to read through. I purchased the lanterns on Amazon. My husband converted them to LED battery operated. If you google "battery operated lanterns" they should pop up for you. I hope this helps! I love this room! Where did you find the curtain rod? It looks like has a natural twine on the ends?!? 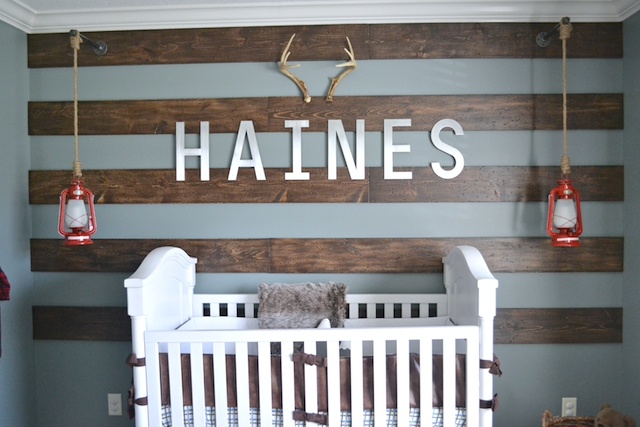 My baby shower & my nursery have used this room for inspiration for our baby boy due in September! Thank you so much! The rod was purchased at Hobby Lobby. I can't seem to find it online, you may want to check the stores. Hi there! 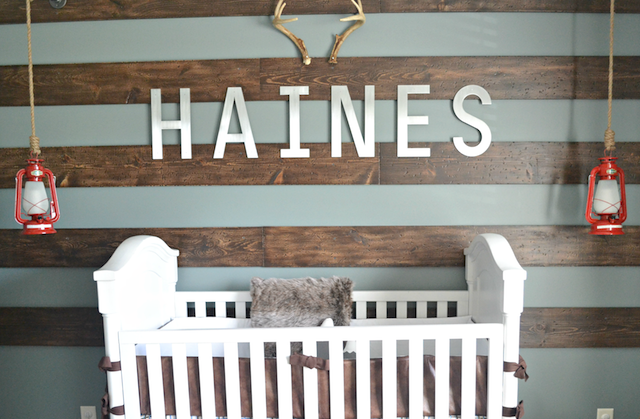 I was curious on your metal letters that your husband made for your nursery...would you all by chance take an order for a name to be done just the same way? I would be so interested in purchasing my son's name --- see he has the letter X in his name and I cannot find one in any of the galvanized letters out there in the stores...I have searched everywhere. I've been on Etsy and no one sells an X. Sigh. So I was curious if you'd ever make custom ones and sell them???? Hi there! 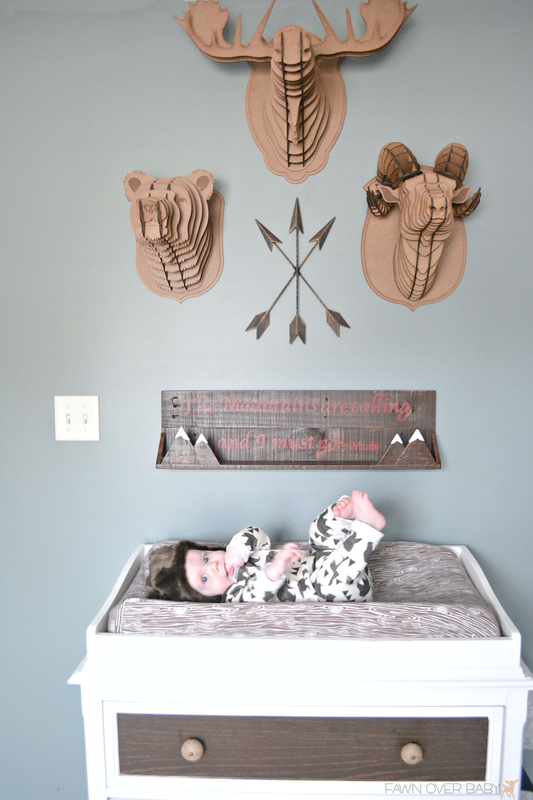 This nursery is awesome! 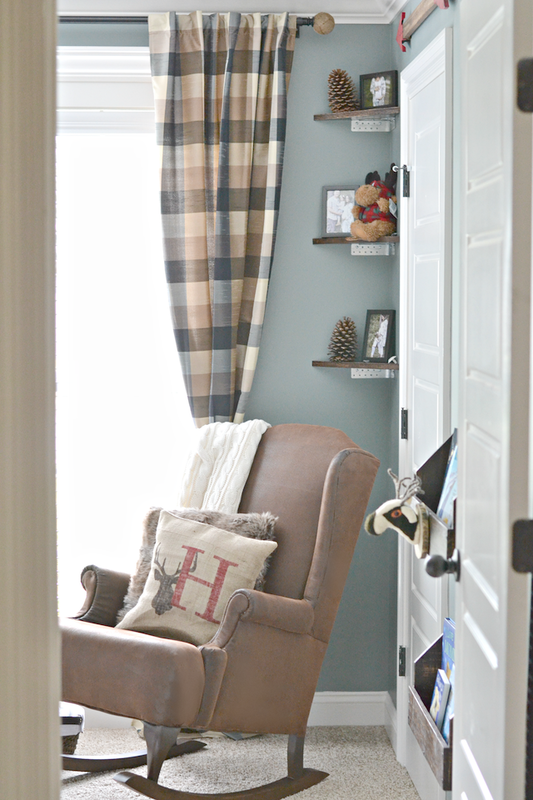 I can't find those curtains online at hobby lobby...do you remember the specific brand? They are gorgeous and would be awesome in our nursery. I believe they are from brand "Decorative Panel" - it looks like its all sold out. I'm unable to find online. I'll see if I can find any similar. Thank you!! I really appreciate it! I'll keep checking for them to be in stock. I don't know if you'll see this question because its been awhile but where did you get the wood for the stripes on the wall? Is it a pallet and you stained it? or did you buy it! I love the idea instead of the whole wall being wood! Thanks and your baby boy is adorable!